Bex, member 3 of The Marriage Pact- a plan for all 3 best friends to meet and marry their dream men, is enjoying life. Her 2 best friends, Hadleigh and Melody, have gotten married and are expecting bundles of joy. Bex’s work is going well and she is in the midst of training for a marathon. Bex knows she wants love- but she’s still gun-shy after losing the love of her life a few years ago. She’s not looking to settle NOR is she looking at every man wondering if he’s the one- she’s content to wait till a worthy man comes along. Tate Calder might fit the bill. Attractive, friends with Melody and Hadleigh’s husbands and looking for a quiet life to raise his 2 sons- Tate has many great qualities. When Tate and Bex start spending more time together- they find that the share a mutual attraction. But both have been hurt in the past- Bex, because she lost love and Tate, because of his deceased wife. Can the 2 put the hurt in the past and forge a life together? 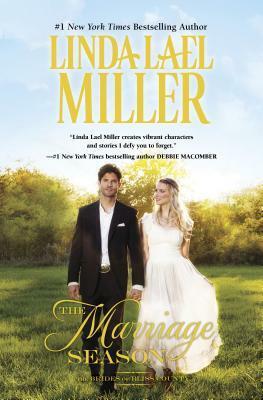 This is my 3rd Linda Lael Miller book- and I am so glad I started reading them. They are perfect cozy comfort reads! While Hadleigh might be my favorite (I adore her spunkiness in the first book) Bex has much to offer as a character. She’s a business woman, she’s an aunt trying to pick up the pieces of her sister’s life and protect her nephew, she’s a woman who has known love and won’t settle for less than she deserves. She’s an every-day woman- very relatable and understandable. Tate Calder is a sweet man. He’s putting his kids first- wanting them to have a life where he can be around, making memories. He’s skittish at times- but the reader can tell how much he wants a happy ever after with Hadleigh- his past has just scared him. The setting- small town Wyoming. Country ways, fresh air and easy living. Cannot get more picturesque. Bottom line- if you read the other Brides of Bliss County- you will love this one. If this is your first book in the series (because it can totally be read as stand-alone) do yourself a favor and read the other 2. Light, fluffy, funny at times, and aww-inducing- don’t miss out! *This book was sent to Traveling With T via Netgalley from Harlequin and Little Bird Publicity. All thoughts and opinions are mine alone. THE MARRIAGE SEASON was a Traveling With T May Futuristic Friday selection. Looking forward to reading this soon (I’ve enjoyed the previous books). If you enjoyed the previous books- this one nicely wraps up the trilogy. I hope she’ll revisit the ladies one day!